Something truly remarkable happened at Copenhagen yesterday. 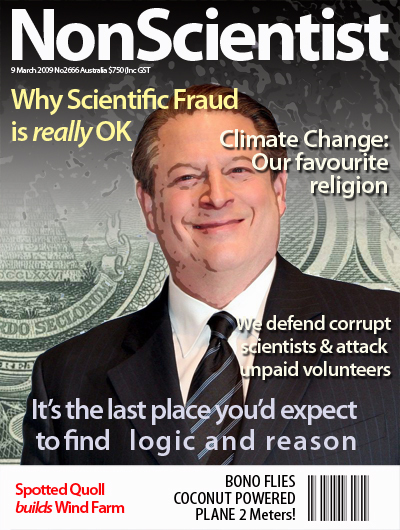 Al Gore told yet another of his massive whoppers about ManBearPig. But this time no one believed him. Interesting to see that story reported in the Times, of all places. Apart from The Independent, no British newspaper – not even George Monbiot’s home the Guardian – has been drinking the AGW Kool-Aid quite so fervently as the Times. From its vast hordes of Eco correspondents to its Op Ed editors and writers, the Times prides itself on being greener than Dr Rajendra Pachauri’s favourite green underpants after a month’s detox diet of spinach, wheat grass juice, parsley and pure essence of ultra-viridian greenness. So yes, for the Times to report on the Holy Father of the global AGW movement making a total dork of himself is indeed a landmark event. This is not, of course, the first occasion on which Arctic sea ice coverage has proved stubbornly unhelpful to the Climate Fear Promotion lobby. In 2007 all the Warmists’ dreams seemed to be coming true when satellite images showed arctic ice coverage receding at record levels. (That’s since satellite records began way, waaaay back in 1978). The Arctic’s sea covering has shrunk so much that the Northwest Passage, the fabled sea route that connects Europe and Asia, has opened up for the first time since records began. Which was quite true providing – as Ian Wishart reminds us in Air Con: The Seriously Inconvenient Truth About Global Warming – you ignore the people who had successfully sailed through the Passage in 1903, the 1940s and 2000. Still it was enough to inspire intrepid kayaker and human polar bear Lewis Gordon Pugh to launch a dramatic September 2008 expedition to raise awareness of AGW by kayaking all the way to the North Pole. Tragically about 600 miles short of his destination he got stuck by the ice. After the inconvenient arctic sea ice recovery of 2008, Warmists attempted to finesse their argument by saying that although most of the ice seemed to have come back it was the WRONG KIND OF ICE. They called it “rotten ice” – something that deceives satellites into thinking its proper and thick when it is in fact rubbish and thin. This latest exercise in excuse-making has now been demolished on the Watts Up With That site, which points that not one of the major scientific institutions that monitor sea ice levels have supported this theory. President Obama: Another Busy Day in The Oval Office!